You won’t find Newry City AFC parking the bus while Darren Mullen is in charge at The Showgrounds. The border men have approached the challenge of promotion to the Premiership head on, and Mullen is adamant they will keep their principles intact no matter who they are playing. “We go into every game trying to get three points no matter who it is we’re playing,” he said. “We certainly won’t be trying to contain teams and trying to keep the score down. “The minute that happens I won’t be manager because you have to be ambitious and set yourself up to get a win. “We are going to be the underdogs no matter who we are playing so we need to make sure we pick up points. “At the start of the season I think everybody probably had ourselves down as relegation candidates, and that’s fair enough. “You’re coming into the league as the new boys, so I can understand why they would think like that. “But apart from the first half against Ards we have played really well. “Unfortunately when we have made mistakes we have been punished. “We’ve also been without four or five defenders. “I don’t like moaning about players being missing, but if you take that number out of any squad in the league they are going to struggle. “We are acquitting ourselves really well and we are enjoying being here. “We’ve never been a squad that has got too deflated after results, you can’t afford to be like that. “The minute you start feeling sorry for yourself you will end up getting severely punished. “There’s always a good mood around the place. If there’s any issues we sort it out in the changing room. “The Friday night after the Warrenpoint game a couple of players had words with each other and I let them at it because sometimes that’s a good thing. “Then we spoke about it together and we realised that we didn’t lose the game and took the positives out of it. “We’re enjoying life in the Premiership, we’re enjoying the fact that we are competing with teams that are way above our levels of finances and things like that. 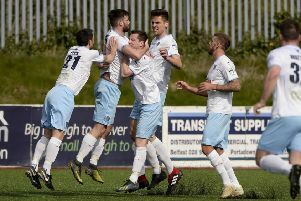 Newry head to Ballymena United this Saturday in what is the Sky Blues first home game of the season. Boss David Jeffrey is well aware of how good a spirit is in their dressing room. “You talk about a close knit team who fight for the cause,” he said. “The players are from the area and know one another, and likely play other sports together, almost like a brotherhood. United will be without defnder Johnny Addis for a few weeks after he limped out of last week’s defeat at Linfield with a hamstring injury. “His performances this season have been of the highest highest quality,” Jeffrey said. “He is one of those (players) who we were delighted to get. “His professionalism, his application, his consistency are first class. “We are now panicking a wee bit in terms of the length of time he will be out,” added the Sky Blues boss.